Not to be confused with Military Order of the Loyal Legion of the United States or American Legion. Composed of four sub-legions, each commanded by a lieutenant colonel. Sub-legions were self-contained units with two battalions of infantry, a rifle battalion (light infantry skirmishers armed with Pennsylvania long rifles to screen the infantry), a troop of dragoons and a battery of artillery. The Legion of the United States was a reorganization and extension of the Continental Army from 1792 to 1796 under the command of Major General Anthony Wayne composed of professionally trained soldiers, rather than state militias. The Legion was composed of four sub-legions each with its own infantry, cavalry, riflemen and artillery. The Legion was formed as a policy instrument in the Northwest Indian War to avenge Gen. Arthur St. Clair's defeat on the Ohio frontier in 1791, and to assert U.S. sovereignty over Miami Indian country in northern Ohio and Indiana. The Legion is best known for its victory at the Battle of Fallen Timbers in Aug. 1794. In 1796, after the death of Anthony Wayne, the Legion was rechristened the Army of the United States. The impetus for the legion came from General Arthur St. Clair's disastrous defeat at the Battle of the Wabash by Blue Jacket and Little Turtle's tribal confederacy in November 1791. The Founding Fathers had been suspicious of standing armies not civilians, believing that the militia would be suited to all the nation's defensive needs. However, the defeat of St. Clair and his predecessor, Josiah Harmar, whose forces were drawn principally from state militias, caused a shift in thinking. President Washington drafted a list of sixteen general officers from the American Revolutionary War to lead an expanded Army in the Northwest, including Benjamin Lincoln, Daniel Morgan, and Friedrich Wilhelm von Steuben. After consulting with his cabinet, he picked Wayne to lead the new professional army, although Washington originally considered him too vain. At the recommendation of Secretary of War Henry Knox, it was decided to recruit and train a "Legion", i.e. a force that would combine all land combat arms of the day (cavalry, heavy and light infantry, artillery) into one efficient brigade-sized force divisible into stand-alone combined arms teams. Congress agreed with this proposal and agreed to augment the small standing army until "the United States shall be at peace with the Indian tribes". The legion was composed of four sub-legions, each commanded by a lieutenant colonel. These sub-legions were self-contained units with two battalions of infantry, a rifle battalion (light infantry skirmishers armed with Pennsylvania long rifles to screen the infantry), a troop of dragoons and a battery of artillery. With their combined arms organization, the sub-legions can be seen as forerunners of today's brigade combat teams. The legion was recruited and raised in Pittsburgh, Pennsylvania. It was eventually divided into four sub-legions. These were created from elements of the 1st and 2nd Regiments of the US Army. These units then became the First and Second Sub-Legions. The Third and Fourth Sub-Legions were raised from further recruits. From June 1792 to November 1792, the legion remained cantoned at Fort LaFayette in Pittsburgh. The legion then moved to the United States Military's first basic training facility at Legionville in western Pennsylvania on the banks of the Ohio River. The encampment was built on the orders of General Anthony Wayne. In fall 1793, the Legion decamped by barge and advanced to the western Ohio frontier down the Ohio River to a camp near Fort Washington dubbed "Hobson's Choice". There they were joined by units of the Kentucky Militia under Brig. Gen. Charles Scott. A month later, the Legion moved northward past the western outpost Fort Jefferson into Indian country and established Fort Greene Ville. General Wayne also established a succession of forts reaching into far northern Ohio and into Indiana to ensure adequate re-supply, and garrisoned these forts with freshly trained legionnaires. The Legion of the United States was engaged in several attacks on their convoys as the expedition pushed further into Native American strongholds, chiefly towards the Maumee Rapids. For a period of three years, starting on June 25, 1792, Fort Jefferson, along with the Legion ammunition supply trains en route to the fort, were under constant siege by native forces. On June 30, 1794, just outside the gates of Fort Recovery, built on St. Clair's battlefield, now Fort Recovery, Ohio, a pack-horse convoy, led by Major William Friend McMahon, of Yellow Springs, Ohio, was attacked by 2,000 Native Americans. After Major McMahon was killed and the rest of the survivors fled to the protection within the fort, a full-scale attack was made on the fortification. Fortunately, for the defenders, most of the men, approximately 125 soldiers, were expert riflemen. Fort Recovery also had artillery support to back them up. The battle raged for two days, but the fort was never taken. Some scholars believe there were more native warriors involved in the attack of Fort Recovery than at the climactic Battle of Fallen Timbers. The most notable engagement in which the legion participated was the Battle of Fallen Timbers, southwest of present-day Toledo, Ohio, on August 20, 1794. As the legion's front was attacked by the Indians, the troops closed quickly and pressed with the bayonet. The Indian forces could not withstand the legion's attack and broke and ran. The British in Fort Miami refused to open the gates and the survivors were essentially on their own. Although a short battle, Fallen Timbers was the culmination of an arduous campaign and owes its success to the intense training and discipline of the Legion of the United States. The legion by its very concept was formed and trained from its early days in Pittsburgh, Pennsylvania to fight in a woodland environment. Each sub-legion had its own attached artillery, dragoons and riflemen, light and heavy infantry. Officers, sergeants and enlisted personnel were trained to fight in small units and were used to being geographically separated and fighting on their own. 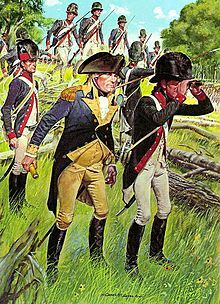 General Wayne's tactics were to fire and move quickly with the light infantry as his front line forces supported by heavy infantry. Additionally, the legion was taught to move quickly on the enemy so they could not re-load, then attack with bayonets. On August 3, 1795, as a result of the Army's victory at Fallen Timbers, the Native Americans signed the Treaty of Greenville, ending the Northwest Indian War. In 1796, Major General Anthony Wayne accepted surrender of all the British forts, including Fort Niagara and Fort Miami that were located illegally within the United States in violation of the Treaty of Paris (1783). The legion also entered the Native American stronghold of Kekionga, which was the goal of the ill-fated St. Clair campaign. The legion built strong fortifications in the town and named it Fort Wayne, in honor of their commanding general. After the death of General Anthony Wayne in Erie, Pennsylvania on December 15, 1796, his second-in-command, Brigadier General James Wilkinson (later found to be a spy for the Spanish government) became the Senior Officer of the Army, and the Legion was rechristened the United States Army. The 1st, 2nd, 3rd, and 4th Sub-Legions became the 1st, 2nd, 3rd and 4th Regiments of the Army. The coat of arms for the 1st U.S. Infantry Regiment shows part of the shield in red in honor of the 2nd Sub-Legion. The 1st Infantry Regiment is descended from the 2nd Regiment U.S. Army. The distinctive unit insignia worn on the epaulette of the 3rd U.S. Infantry, also known as "The Old Guard", is a gold-colored metal device that shows "an Infantry officer's cocked hat of 1784 with plume." This alludes to the crest of the 3rd Infantry Regiment's coat of arms, which shows a black cocked hat with white plume. These are the colors of the 1st Sub-Legion. An example of a similar hat can be seen in the uniforms of the 3d Infantry Regiment's Fife and Drum Corps. The coat of arms of the 4th U.S. Infantry Regiment is green and white in honor of the 4th Sub-Legion. ^ Kochan, James (2001). United States Army 1783–1811. Men-at-Arms Series. Osprey Military. pp. 13–15. ISBN 1-84176-087-0. ^ Sword, Wiley (1985). President Washington's Indian War: The Struggle for the Old Northwest, 1790–1795. Norman, Oklahoma: University of Oklahoma Press. p. 205. ISBN 0806124881. ^ "The Man Who Double-Crossed the Founders". Morning Edition. NPR. Retrieved 2017-04-04. ^ "3d Infantry Regiment". The Institute of Heraldry. Retrieved 4 February 2015. ^ "Press Materials". The Old Guard Fife and Drum Corps. Retrieved 4 February 2015. This page was last edited on 5 April 2019, at 18:30 (UTC).